Henosis interviewing arsnecopinata about upcoming debut solo exhibition! Henosis team (artist Ashvin and artist/art journalist B’lu) were visiting me at my studio for an interview about my upcoming solo at La Parole Art Gallery Khalifa City, Abu Dhabi in November 2017. 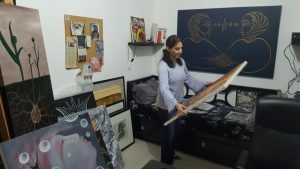 It was just a week after the curator Claude Habib visited to select artworks for my very first debut solo exhibition. Until end of last year I never considered at all to dare a solo exhibition, and it never would have crossed my mind in wildest dreams, to have the slightest chance for a solo in a real registered art gallery. Now it will happen. In November at La Parole Art Gallery in Abu Dhabi. For the first time there will be no chance at all to ‘hide’ behind other artists during an exhibition opening. The attention will be all mine. ‘Arsnecopinata’ will be officially introduced to the art world. How all that happened to become reality and what/who changed my mind to actually consider and dare a solo exhibition in first place, I will explain here during the next days. This entry was posted in Art Blog English and tagged Abu Dhabi, arsnecopinata, art studio, artblog, artist interview, debut, exhibition, Henosis, La Parole Art Gallery, solo exhibition. Bookmark the permalink.